A beautiful 9ct white gold eternity ring set with elegant round diamonds. Perfect as a gift for a loved one on your anniversary, or merely as a declaration of your commitment. 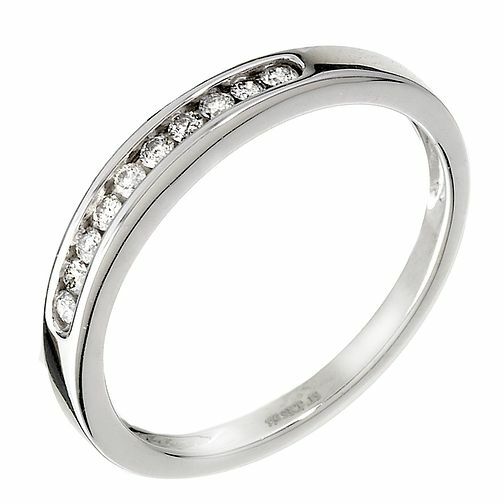 9ct white gold 0.15ct diamond eternity ring is rated 5.0 out of 5 by 2. Rated 5 out of 5 by Anonymous from Perfect My wife has dropped plenty of hints about the type of ring she would like as an eternity ring, but picking the right one is still a fraught process. However, this one proved perfect - the right width, the right style, the right shape. She loves it, and I've earned a coulee of brownie points!